For many of us, garage doors are the largest moving part of our homes. However, we also often neglect our garage doors when it comes to spring cleans and general household maintenance. This seems bizarre because garage doors are also very expensive to replace. A small bit of regular maintenance is inexpensive and can go a long way. At Garage Door Rescue, we often get phones calls from customers who think their garage door is on its lasts legs. However, more often than not, a small bit of maintenance can make it almost as good as new. One very common solution to a number of problems is using lubricant on your garage door. This is why we have created this guide to offer helpful advice and information on when and why your garage door might need a bit of lubricant. If you have any further question, please do not hesitate to contact us on 07590 575002. Your local garage door specialists will always be on hand to help with your garage door maintenance and repairs. Does My Garage Door Need Lubricating? We recommend lubricating your garage door on a regular basis to prevent and more permanent damage. Whether this be once a year or quarterly is up to you and may depend on the type and condition of your door. It is often particularly worthwhile to lubricate your garage door after a bad spell of weather. Rain and snow are known to cause the metal to rust and if this is not attended to, you may need to replace your garage door sooner than necessary. Regular garage door maintenance, including lubrication of the moving metal parts, can prolong the life of your garage door. It is up to you whether you carry out this work DIY style, or contact your local garage door specialists so they can do this for you, ensuring top quality. Why Does My Garage Door Need Lubricating? The lock might get stuck. If these signs are not dealt with, your garage door will become dangerous to use. The metal may start to erode and then the mechanism of your garage door could fail. This could lead to your garage door collapsing on your car or yourself. Don’t compromise your safety by neglecting your garage door maintenance. If your garage door is making a loud screeching or banging noise when you open and close it then this is probably a sign that the moving metal parts need to be lubricated. Time, use, and bad weather can cause garage doors to rust so it is important to keep the tracks as smooth and clean as possible. Another sign that it may be time to lubricate your garage door is if it is stiff/difficult to open and close. Just a small amount of lubricant can make its operation a lot easier. The same goes for the lock. If the lock becomes difficult to use because maybe it keeps getting stuck, it may just need a thin layer of lubricant to get it working smoothly again. People commonly think that the above are inconveniences that will have to learn to live with, however, the noises and the struggle do not have to be permanent. As well as when it is obvious, we also recommend lubricating your garage door on a regular basis to prevent these problems arising. However, if the issues continue after you have lubricated the moving metal parts, you should get in touch with your local garage door specialists and they will have the solution. Garage door maintenance such as lubricating your garage door can be carried out in a DIY style or by professionals. You will likely receive a higher quality service from a specialist and they will be able to spot any brewing problems that may arise in the future. However, if you feel confident doing it yourself then we have put together a short guide to advise you on your garage door lubrication process. The springs, rollers, tracks, and hinges are the areas which will need the most attention. We recommend that you follow our guide below for your own safety and so you get the end result that you want. Firstly, It is important that you start the process with the garage door securely shut. It would cause a lot of damage if the door was to automatically shut whilst your hands are on the tracks. Then you should probably clean and tidy the area. We recommend that the garage door, particularly key areas like the tracks, are rubbed down with a rag to get rid of any dirt. If you have applied the lubricant previously, then it is important to remove as much of the old lubricant as you can. The goal should be to be able to see the metal again and not black grime. Tracks – It is important that you clean the track to get rid of dirt and grime which could be preventing your garage door operating smoothly. The tracks do not need to be lubricated themselves. It may be a better idea to lubricate the moving metal like the hinges. Springs – at the front of your garage door you should notice large springs. They are high tension springs so you should definitely avoid touching them with your hands. A spray lubricant will be needed here to spray a thin line of lubrication along the top of the spring. Movement of the garage door will cause the lubrication to work itself into the spring. Hinges – if the hinges on your garage door are made from steel then you should put a small amount of lubrication on them. Do not do this if they are plastic as the lubricant can cause the plastic to break down over time. Rollers – you should check with the manufacturer of the garage door whether it is ok to lubricate the rollers. In a few garage door designs, the lubricant may be forced into clumps. The lock – If your key gets stuck or the lock is difficult to open and close, a small amount of lubricant may be just what it needs. Make sure you get the lubricant into the tumbler as well as on the moving parts. Once you have all your garage door parts properly lubricated, lift it open and close several times to even out the lubricants distribution. If you still hear a lot of noise coming from your garage door, follow the sound to determine where it is coming from. This may be an indication that you have simply missed a moving part or if the problem is more substantial. If the later, you should contact your local garage door specialists so they can offer a solution. Feel free to contact Garage Door Rescue at any point during this process on 07590 575002. Our experts will be happy to help whether it be instructions over the phone or a call out visit to solve the problem for you. 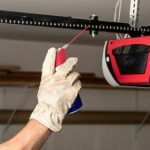 What Lubricant Should I Use For My Garage Door? It is important that you purchase the right lubricant for your garage door. The common shelf favourites are likely not right for garage doors. This is because thick lubricants serve to attract dirt which will ultimately lead to your garage door becoming worse off than before you started. You will need more specialist lubricants. Often lithium based grease products work the best due to the fact it is moisture resistant, performs well in different temperatures, and is very effective in load-bearing situations. Aerosols are especially well suited for garage doors as they are suited for injection into small moving parts and they do not attack dust or glump up. When applying the lubricant, it is important not to use too much because soaking can lead to additional problems. A fine spray will suffice. It may save you a lot of time and effort to hire a garage door specialist to do the lubrication process for you. As experts in the field, you are more likely to receive a top quality service that will prevent future problems occurring. They will use all the right products for your garage door and leave your door working as good as new. Garage Door Rescue is based in the South West offering our services in Swindon, Bath, Gloucester, Chippenham, Chipping Norton, Oxford, Reading, and the surrounding areas. We are a trusted company who are always happy to help you in any way we can. All of our staff have many years of experience so can solve any garage door problem that may occur. Contact us now on 07590 575002 for more information on our services.